What a great, great day to be at the races. There was a nice crowd, though the announced attendance of 19,000 included those who showed up for the folding chair giveaway and then left; shockingly, I saw spinners for the first time at Belmont: people going through the turnstile multiple times to get multiple chairs. If you were unable to get here and would like your very own Belmont Park chair, check E-bay tonight…I’m sure that there will be plenty. The Jockey Club Gold Cup was first run in 1919, and it’s the highlight of the Belmont fall meet—it is to Belmont what the Travers is to Saratoga. Remarkably, Kelso won it five consecutive years (1960-1964), and several horses won it two years in a row: Creme Fraiche (86-87); Slew O’Gold (83-84); Skip Away (96-97). The last few years have turned out some fan favorite winners: Bernardini easily won it last year, and in one of the best races I’ve seen, Funny Cide won in 2004. He looked beat at the top of the stretch, and just dug in and flew away to win it, to the delight of the crowd. Old favorite Evening Attire won in 2002. 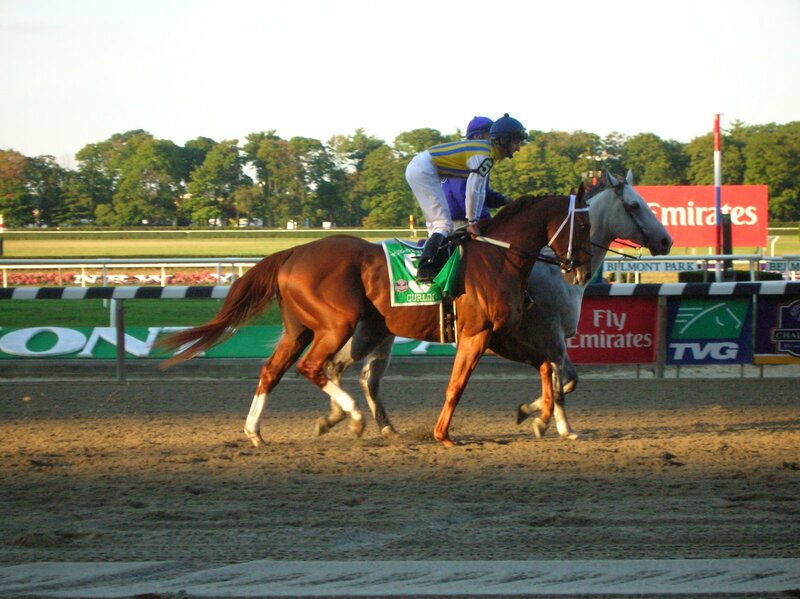 Today’s race is another one that we’ll remember for a while, not least because we saw Curlin do in the Belmont stretch what he did three and a half months ago…except this time, his nose crossed the finish line first. The finish was really, really exciting, and the crowd just threw itself into the moment, exulting in Curlin’s victory and applauding his trot to the winner’s circle. I suspect that they would have done the same if Lawyer Ron had won. The race does not answer any questions about Lawyer Ron’s ability to get a mile and a quarter, the distance of the Breeders’ Classic, and it will now be interesting to see how the odds fall out in a month’s time. More later/tomorrow on the other races.